In a paper published in Nature Geoscience, Stefano Poli described a variety of laboratory techniques to address how subduction influences the deep carbon cycle. As Earth’s tectonic plates move, carbon and other elements are cycled into and out of the crust, mantle, and core. At convergent boundaries, the process of subduction pushes lithosphere from one plate beneath the other. As the descending slab sinks into the mantle it returns its carbon to deep Earth. At the surface, subduction zones result in arc volcanism, and during eruptions carbon and other volatiles are released into the atmosphere. The chemical and physical processes that determine whether carbon is subducted into the mantle or released into the atmosphere via arc volcanism are complex. In a paper published in Nature Geoscience, Stefano Poli (Università degli Sudi di Milano, Italy) described a variety of laboratory techniques to address how subduction influences the deep carbon cycle . Poli conducted high-pressure experiments on model gabbros (a group of igneous rocks) of varying hydration and carbonation to assess the types of liquids formed during melting. These experiments showed that a liquid enriched in CaCO3, H2O, and silica, i.e. a hydrous carbonatitic liquid, can form at temperatures as low as 900°C at 120 km depth. Typically, one would not expect to find carbonatitic liquids in a subduction zone regime because of the large pressure-temperature stability field of solid carbonates. However, when H2O-rich fluids or hydrous minerals break down in the presence of carbonated Ca-rich rocks (e.g. altered gabbros or limestones), carbonatitic liquids can be generated, therefore scavenging carbon, calcium and volatile elements from the subducting slab. Hydrous carbonatitic liquids are extremely mobile and percolate upwards in the mantle wedge and create a CO2-rich source for subduction zone magmatism. Reaction pathways and physical properties of hydrous carbonatitic liquids in Earth’s interior are an exciting area of exploration. Future findings will likely change our understanding of mechanisms of long-term carbon cycling at convergent plate margins. 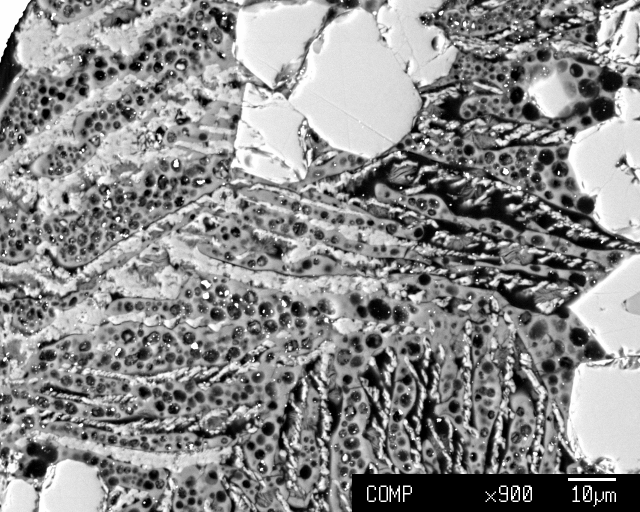 Image: Back-scattered electron image of solids formed from hydrous carbonatitic liquids after high-pressure, high-temperature experiments. Bright dendrites are crystalline Ca-carbonates, spongy areas are silicate glass foamed by fluid bubbles formed during quenching, large grains are garnet crystals. Credit: Stefano Poli.